The winning team will return to Sturbridge Rotary next week to claim the trophy which they will hold until prior to the next years’ game. 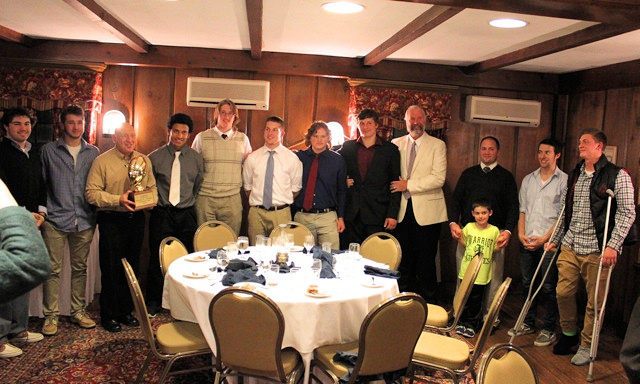 The video shows President Larry (holding the trophy) with Coaches and Team Captains from both teams. Coaches & Captains from Tantasqua & Shepherd Hill. 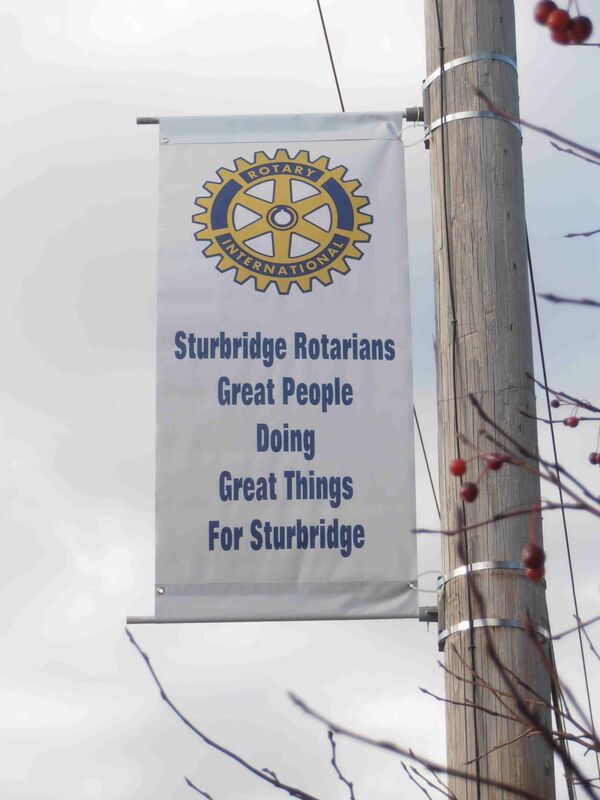 Sturbridge Rotary is among many individuals, businesses and organizations trying to help families in need have a Happy Thanksgiving. 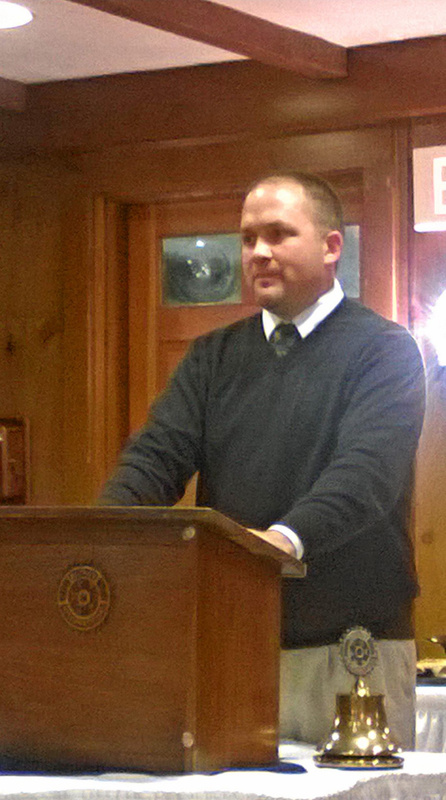 The Club has provided funding for the last seven years to the Catholic Charities Food Share Program of Southbridge. 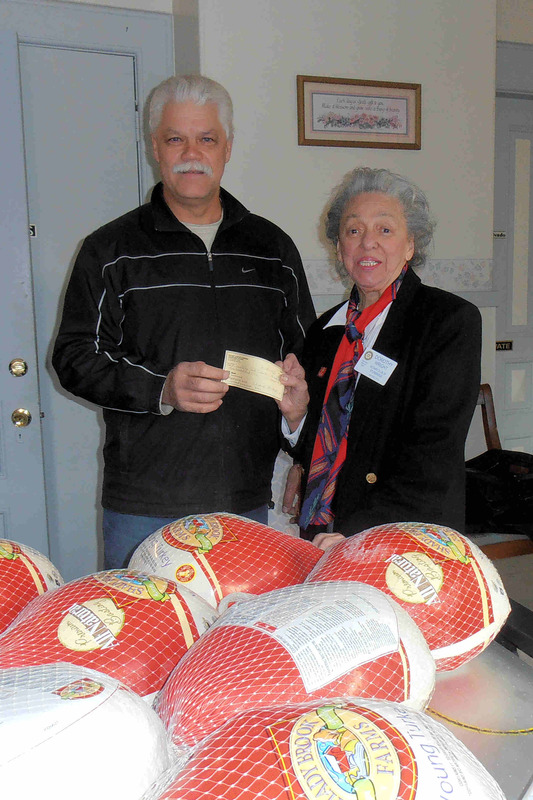 To date over 115 families in Sturbridge and Charlton have received a turkey from Sturbridge Rotary and a grocery certificate to purchase the trimmings to their Thanksgiving dinner. Catalino Alicea, a volunteer coordinator at the Food Bank for the last 26 years, is shown accepting a check from Sturbridge Rotarian Dorothy Wright. Good News! 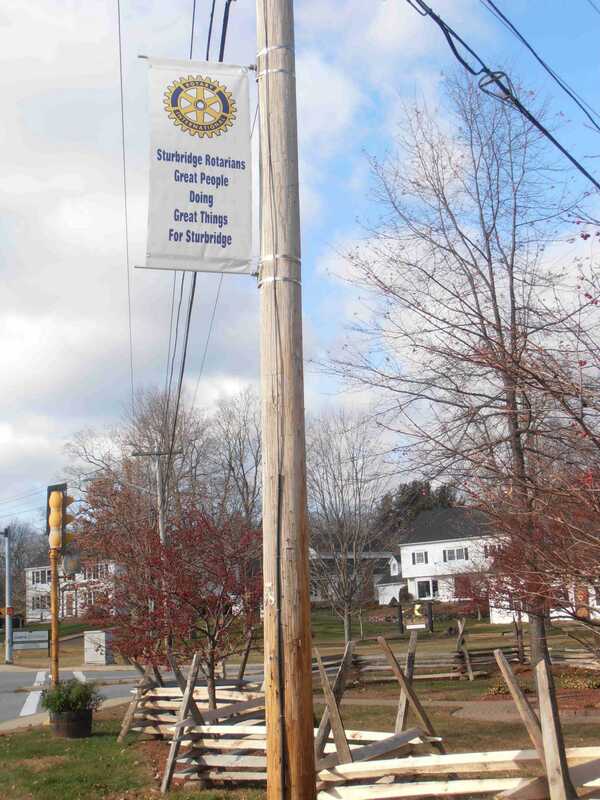 We have replaced the faded banner at Rotary Park with a new one. 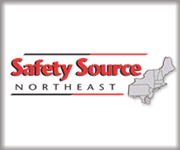 We purchased the banner from the Center of Hope in Southbridge, which they made very quickly. 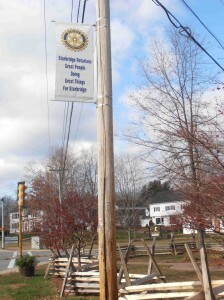 The following day our friends at the Sturbridge Department of Public Works graciously hung the banner for us! We thank everyone involved for their time and effort. When you drive by the Park, take a look! A conflict with our speaker left us with an open meeting. 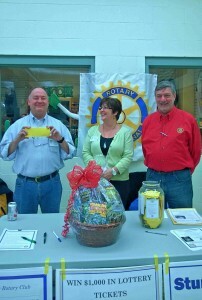 We quickly filled the gap with reports, suggestions, and miscellaneous Rotary information. 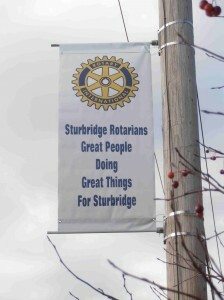 Topics included: Three members who attended the Rotary Foundation meeting; a report on lottery ticket sales; Rotary Visioning follow-up event; the new benchmark for the Club to qualify for fundraising matches; follow-up ideas to develop another international humanitarian project; fundraising; business memberships; a spokesperson for Sturbridge Rotary; and our annual outreach providing Thanksgiving food baskets to those in need. All in all, lots of interaction and anticipation of a busy future for the Club. 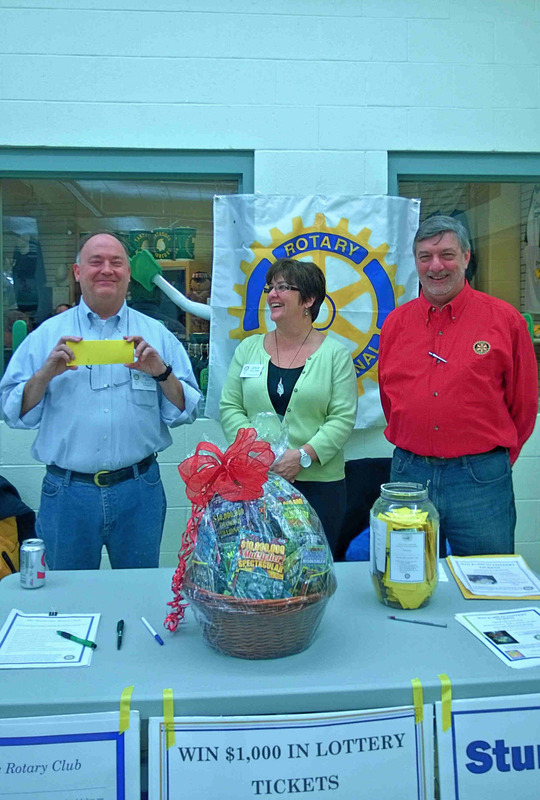 Another successful day of fundraising was held on Saturday when several Rotarians spent the day at the Tantasqua Craft Fair selling chances to win the basket of lottery tickets worth $1,000. Ticket sales at $10 each were quite brisk. The drawing will be held in December so if you have not purchased your ticket(s) yet please do so soon by contacting any Sturbridge Rotarian or simply click the Contact Us tab on this website. 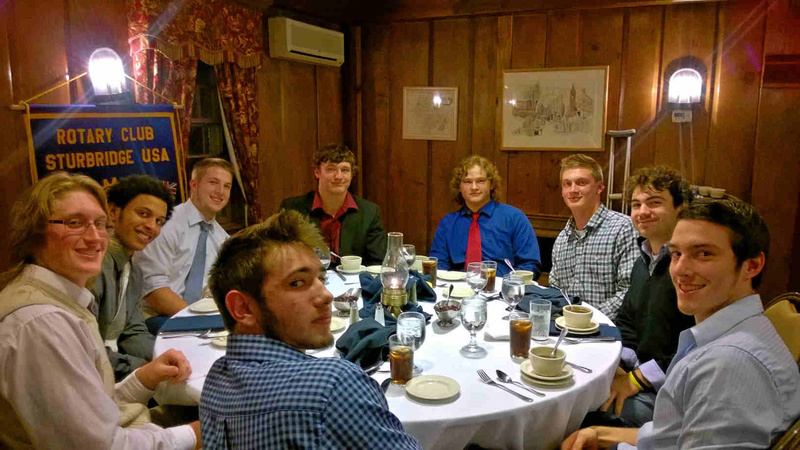 Most of the money from this fundraiser goes to support the scholarships given to Tantasqua students who are pursuing college. 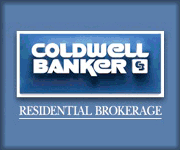 Another great speaker! Last night we were delighted to have Past District Governor (1997-98) Bob Cassidy, from the Bedford Rotary Club, and his lovely wife Carolyn as a speaker. 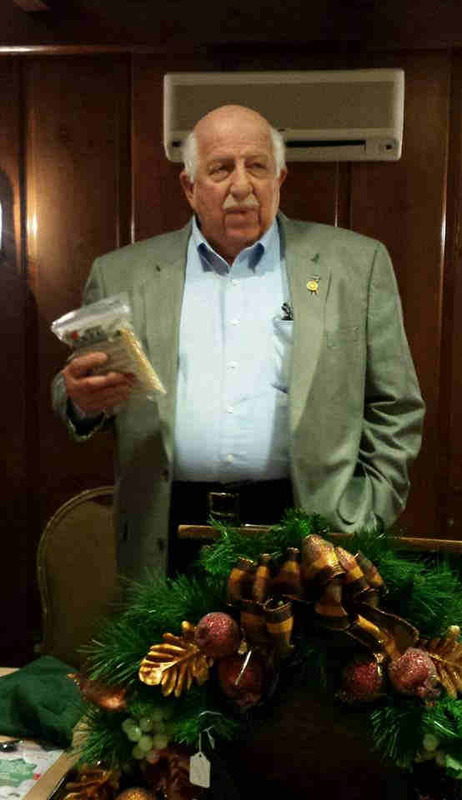 Bob gave us the background of his Club’s support of the campaign to STOP HUNGER NOW. 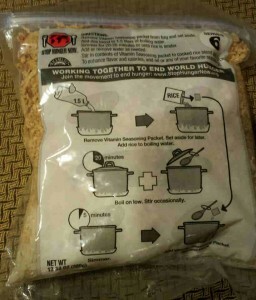 The club raised funds to purchase the materials to fill bags of easily prepared food. Each bag costs 29 cents and provides all the daily vitamins and nutrients that a child needs. When the Club first started this project they raised enough funds to provide for distribution of 15,000 meals. Last year with the help of several other clubs, they were able to raise the distribution to 133,000 meals. The meals are distributed in many countries. As part of his presentation, he shared a video of children in Haiti making and eating mud cakes just to fill their empty stomachs. Bob invited our Club to help package and prepare the meal packets for shipping next April 26th. Harrington Hospital Gift Shop – A Treasure! 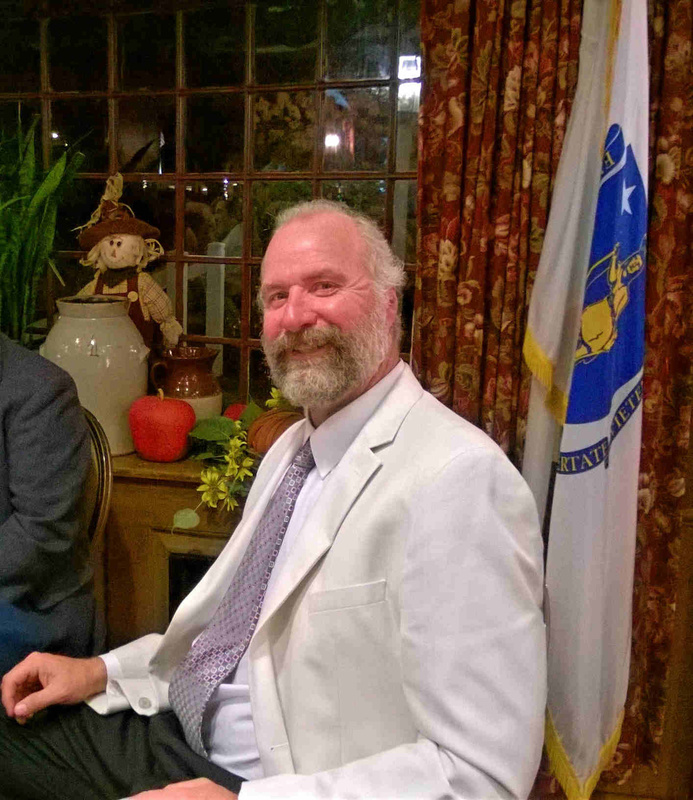 Last night at the Historic Publick House, the Sturbridge Rotary Club meeting room was gaily decorated by the volunteers with items from the Harrington Hospital gift shop. 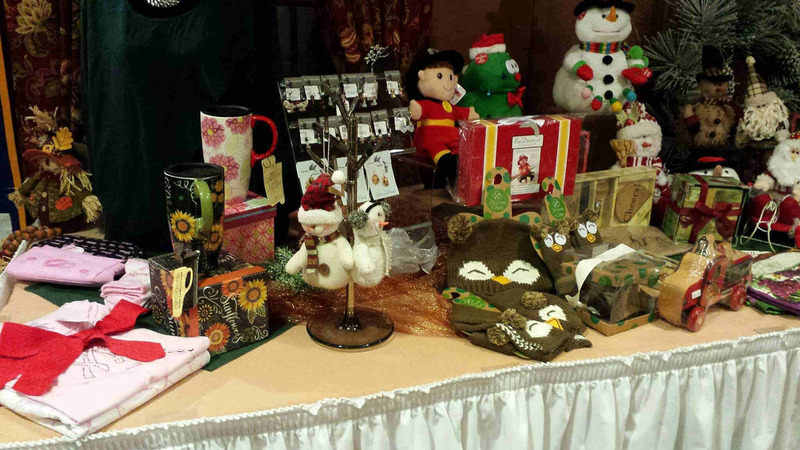 The tables contained a variety of gift ideas for sale at very reasonable prices. 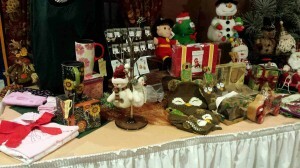 It was very difficult to pass by the scents, stuffies, seasonal items and not pick them up and look them over…hence the fact that the volunteers made over $300 in sales before the meeting began. Darlene Kulesza, volunteer manager of the gift shop gave us a very brief overview of where all the profits are spent. First, they are all volunteers and they were able to give approximately $30,000 towards hospital needs such as: televisions, uniforms for the candy stripers, books for the children and so many other items. They are having a big sale for Christmas on November 21st and are inviting everyone to go there and look them over. The shop is a delight for the eyes and will help you with all your gift needs. 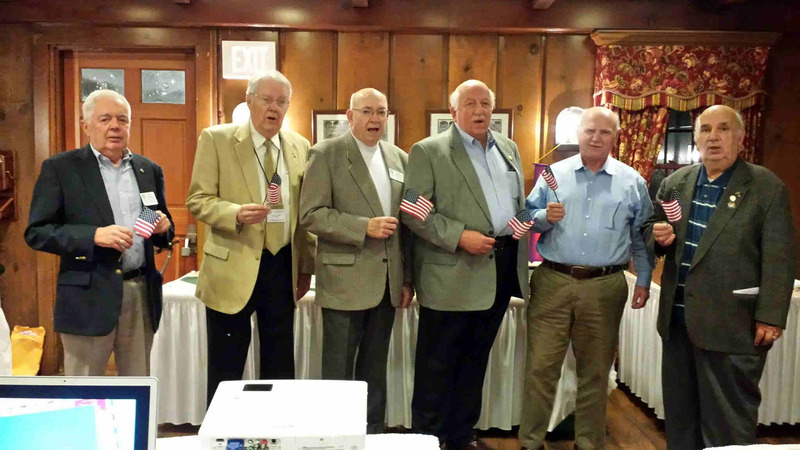 The Sturbridge Rotary Club honored their veterans tonight: Bob Kingman, Air Force 1956-64; Phil Carlson, Marines 1951-53; Fran LaForge Air Force 1955-58; Bob Cassidy, Naval Submarines 1964-72; Austin Jenkins, Army National Guard 1972-2002 and Henry Skarani, Army 1953-56. 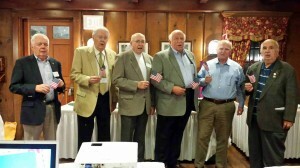 They then sang “God Bless America” beautifully…it was wonderful. God Bless our Veterans. Rotarian Sanjay Deshpande from the Wachusett Area Rotary Club gave a presentation on Liver Health Awareness. He was accompanied by two other Wachusett members, Richard Traina and Charbel Najem and they are spearheading a project to raise funds that will sponsor public screening. Liver disease is a “silent” disease that shows no signs until the liver is seriously affected. If you were born between 1945 and 1965, you are a member of the Hepatitis C generation. The CDC (Center for Disease Control) recently recommended that all people born between these dates have a 1-time screening test for Hepatitis C. There are new drugs on the market that can treat and cure Hepatitis C. If you were born within the specified time frame, you should get tested today. 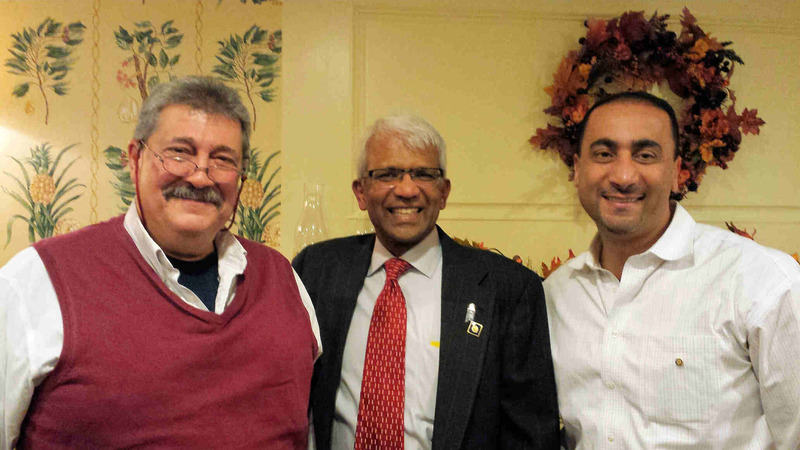 The presentation given by the three Wachusett members is the first part of implementing the 2014-15 District Grant which aims to increase awareness of Liver Health among District 7910 Rotarians. We are saddened to hear of Babe’s passing on November 2, 2014. 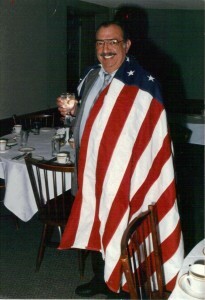 Babe was a member of Rotary for many years. He served as president in 1984-85 and was a multiple Paul Harris Fellow. Babe was a very active member of Rotary and while he worked with the members on projects or at meetings, he’d share his jokes with anyone who would listen. One of Babe’s passions was his little sports cars. Many of us who knew Babe can picture him with a sporty flat-top cap driving one of his cars with the top down. Babe was 85 years young. Our thoughts and prayers are with Lorraine, his wife of 59 years. 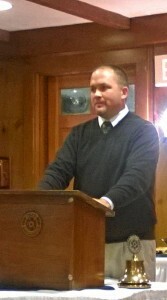 Sturbridge Rotary honors you, Babe, for your many years of service to Rotary and for your friendship.